With a great waterside location this large and modern complex is suitable for everyone. You can either try out the two swimming pools or take a stroll to the beach either way you are always close to the local bars, cafes and restaurants. We have just got back from having 14 wonderful days in the Sunset Beach Apartments. We went self catering and found the room adequate for our needs. There is a Supermarket on the ground floor with everything you need with a great bakery. Or you can pop over the road to a Supermarket. We were on the 14th floor on a corner and had superb views out to sea. We found the majority of the staff very helpful, except the receptionist who was rude. There's nightly entertainment unfortunately the beer was a bit pricey so we never tried it. I would recommend this hotel and would definitely stay again. Just back from holidays. Best ever. Sunset beach was first class. Lots of choice for breakfast. It is a good twenty minute walk to centre, but its a lovely walk. Our apartment was lovely, beds bit uncomfortable. All staff we spoke to were very nice. The place was spotless. There was entertainment on every night. Games room good for kids. Everything you need is onsite; supermarket, hairdressers, beauty parlour, gym, indoor pool (which I understand there is a charge for). We never used it, but it looked lovely. Cannot wait to go back. Hotel was clean, room was spacious enough for the two of us with room to spare. Kitchen, whilst small was very well equipped. We stayed B&B and found the breakfast plentiful. The hotel is a little 'out of the way' of the main area of Beanlmadena and that was a dissapointment to us during the evenings whe we wanted to go out to drink - we had hired a car for our stay but when out drinking we cabbed everywhere. The main Marina area is a good 20 minutes plus to walk - a cab is 8 euros each way. nd consistent. Plenty of fresh towels and bed linen even though we onlyh stayed for 5 days. We did not check out any entertainment - do't even know if there was any on as we went out each night but did have out night cap in the hotel bar - which was very well patronised by the Irish - who can be a little loud at times but hey - they wer on there holidays too ! 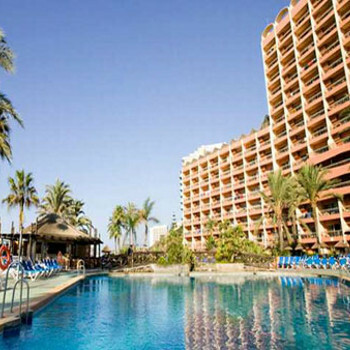 If I decided that I wanted to revisit the concrete jungle of Costa Del Sol then I would go back to this Hotel...but I think the Costa Del sol is perhaps for many others but not me. After reading holiday truths, about the internal rooms, we checked our booking form to find that we had been allocated one of these rooms, with no view, but a wall. I contacted the hotel (manager) explaining that we had requested our Travel Agent for a south facing room, as we were going on a long stay, and sitting on a sunny balcony was part of our holiday. After a couple of e-mails, to and from, he advised me to contact our travel agent, which we did, and had to pay extra for an exterior room! When we arrived, room 858 we overlooked the beach, which was very nice, but North facing (no sun) We asked reception for a south facing room and was told none available (this is a time share Hotel and no doubt these were probably given to them! )And also if you are Irish you are o.k as most of the ones we spoke to who had the best rooms, overlooking the pool, were Irish. There is a lot of renovation going on, and we had to move rooms because of the noise-drilling, hammering etc. We found that if you wanted to go anywhere, it was bus, or taxi (6/7euros. )unfortunatly we are not walkers. The rooms are on the small size- only room for one in the "kitchen" we would rate the apartment 3star compared to other 4star ones we have stayed in. Ok for short stay, but not for us long stayers. We would definitly not go back to Sunset Beach Hotel, as there are much better hotels, in better positions, and we have never had to pay extra for a balcony with a view. We felt cheated. The menu in the Dining Room was o.k, but after 4weeks we could have done with a change. They should put a Chefs Special on each night. Standard was a grilled tomato, 1/4 sweetcorn, and 2 mushrooms, choice of chips or jacket. Some of the waiters, were very offhand. This report might sound as if we are a couple of moaners, but I can assure you we were not the only ones with these comments. And to top it all we came down with Gastro Enteritus the 2nd. week, I ended up in hospital, in intensive care, I was only in for 24hours, but it was a frightening experience. The Doctor that came to our room told us that we were not the only ones. After that experience, we cooked in our apartment. There is an Aldi type supermarket opposite the Hotel which is very good. The amenities in the Hotel are excellent, plenty going on, and also a book lending room. This is our 3rd visit to Sunset Beach and we have booked again for next year!!. What more could you need it's close enough to walk to all the restaurants and bars but not too close that you cant sleep for the noise. Its practically 5 euros anywhere in a taxi like to the Marina (which is only a 15/20 min walk anyway) to Tivoli, to Paloma Park. The room service was excellent - fresh towels every other day and clean sheets every other - beds made every day (although I think we were lucky there as its not the norm! )We tend to do our own thing for brekkie but had it there one morning - not bad lots of choice but busy- they do a 30 euro for 5 brekkies which is not bad for the choice. The pool was guarded, security was clearly seen - all entrances are accessed by room cards so v.safe for kids. Entertainment was a bit off as out of season but they did a great paella cooking show - with free wine and you got a large portion to taste too!! Would recommend for all ages - although v.v.busy in high season - we love it - it's like home from home - staff are great too! This hotel was a good quality 4 star rated hotel. I stayed with 6 adults and 4 children. The hotel was ideal for them. they enjoyed the pools and facilities available. I also stayed during the rowdy group of Irish males and they were well out of order. How can a group of men go away together and all they want to do is fight each other, pathetic. If any of these cowards read this I hope they are proud of the fact they spoilt the holidays of a number of people because they couldn't control their drink. Anyway, when I complained to the hotel they upgraded our rooms and called the police to deal with the cowards. One of the males was arrested. the hotel also refused to serve them alcohol for the last 2 days of their stay. The interior rooms are not very good. They are dark and dingy, no natural light. The exterior rooms are much better and try and get a sea view, well worth it. The staff were friendly. The bar was good, however a bit pricey. happy hour between 7.30 and 8.30pm. The hotel is 20 minutes walk from the marina, not that far. Across the road from the hotel is a burger king, garage, aldi style store and just up the road, about 2 minutes walk away a local supermarket. Overall I thoroughly enjoyed this hotel, only spoilt by some mindless thugs who couldn't handle their alcohol. I travelled to the Sunset Beach Club with my husband and two children(Both girls 13 and 11)We thought the hotel was very clean and definetly deserved to be rated 4*. The room was again very clean A little bit cramped but still satisfactory.The entertainment was fantstic my kids never wanted to leave the complex!There was a kids club and a teenagers club which my children went to everyday without fail. I travelled with my husband and mother-in-law and the hotel was wonderful and the staff were very friendly and helpful. The rooms are very clean and well presented,the hotel restaurant was really good at night and the choice was as excellent as the service. The only down side is you do not have children try to go when kids at school or do not have a poolside room as it is extremely noisey. If you have kids it has a fantastic kids club. Going back next year in term time and hope its as enjoyable as this year. Myself, my mum and my cousin have all returned from a holiday at the Sunset Beach Club. It is a lovely clean hotel in a good location. It's about a 30 minute walk from the marina but you can get a taxi if your feeling lazy and this will only cost you 7 euros, but all the way to the marina there are shops and bars to have a few drinks in on your way. The only complaint I have is room 563 which we were given first of all, there is no view just a brick wall and above you is a bar so its permanent scraping of chairs on the ceiling. I think they knew this as when we complained they moved us to a room with a view elsewhere without so much as a grumble it was no problem, we ended up in a nicer room with a lovely view no extra charge. I'ts a nice clean hotel and the staff are friendly and helpful. We had a lovely time and would go back tomorrow if we could.